Chloe Benjamin brings us an emotional novel about a universal question--What if you could find out the date of your death? Would you want to know? Would it change the way you live your life? When Daniel Gold hears the rumor that there's a fortune teller nearby, he convinces his sisters, Varya and Klara to go and find out what their future holds with little brother Simon tagging along. However, this is no ordinary fortune teller, this fortune teller will give you the date of your death. For the Gold children, the answers become complex and yet very simple as they figure out how to live their life with a date that looms over as a blessing or perhaps a burden depending on your views. 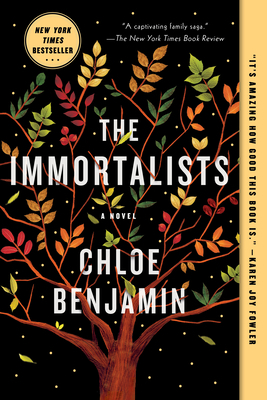 The Immortalists is a phenomenal story that will draw you into each siblings life and leave you hungry for more. On the Lower East Side of Manhattan in the late 1960s, four children meet a fortune teller, who tells them when each of them is going to die. Do I really need to say any more? The four sections of The Immortalists are told by a different sibling, and the story rockets across the country, veering into emergent gay culture, the world of magicians, a military processing station, and an aging research lab. Simon, Klara, Daniel, and Varya each must confront a life where free will and destiny collide. Don’t worry, you won’t get whiplash from the twists the story takes, but you will likely fall in love with the Gold family and Chloe Benjamin’s novel, a whip-smart and unexpectedly philosophical story of fate, faith, and family. This will be an excellent book club book. The narrative is a study in the differences of philosophies: Simon's fatalistic/nihilistic determination; Klara's Determinism; Varya's belief that diligent, perhaps obsessive, organization of life will keep the gypsy woman's prophecy from touching her life - keeping herself hidden in seeming safety, sequestered in science; and Daniel's denial, outfitted with 'blinkers', about his accountability to the role he plays in sending young people into harm's way. We may ask ourselves, and others, whether or not it is the moment by moment decisions we make that comprise the stepping stones toward death. There is much to discuss in the way of human history, and what it is that causes a human being to view the inevitability of death as a journey, filled with opportunities to exercise free will; or a trek ending at a specific destination in time and space. THE IMMORTALISTS slowly ripped pieces of my heart away leaving me as wrung out as I’ve ever been after finishing a novel. So OF COURSE you all have to read it for the emotions Chloe Benjamin conjures up, the brilliant narrative structure, the writing so beautiful you will literally read some sentences twice, and the moments that will make you gasp out loud in surprise. What’s it about? Four siblings visit a fortune teller and each learns the exact day he or she will die. This information haunts them over the course of their lives, particularly after the death of the youngest, Simon. His death struck me the hardest because I could see it coming, knew how it would end for him, and I read on, helpless. The story come to a satisfying conclusion when the oldest, Varya, examines what it means not to simply exist, but to LIVE!